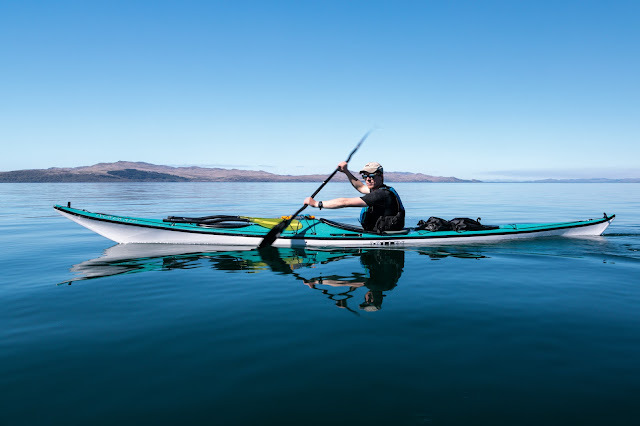 Paddling and portaging in the wake of the dead. Our original intention had been to paddle the Small Isles at the beginning of May but a last minute increase in the forecast NE winds caused us to head further south for a trip out to Oronsay and Colonsay via Jura. It is just as well we did. My brother Donald (who we had arranged to meet on Eigg) has a large inflatable with a 25HP outboard and he had committed to the Small Isles but spent 3 days and two nights on Canna stormbound. 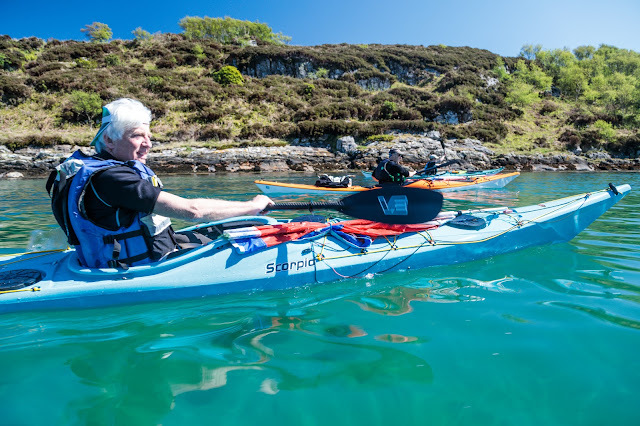 So David, Ian, Maurice, Sam and I met at Carsaig Bay on the Sound of Jura. We were bound for Tarbert Bay on Jura where we would portage across into West Loch Tarbert, following the route of the wealthy dead of Argyll as their bodies were carried out to the Holy Isles of either Oronsay or Iona. The Paps Of Jura rose enticingly above the low headland which encloses Carsaig Bay. 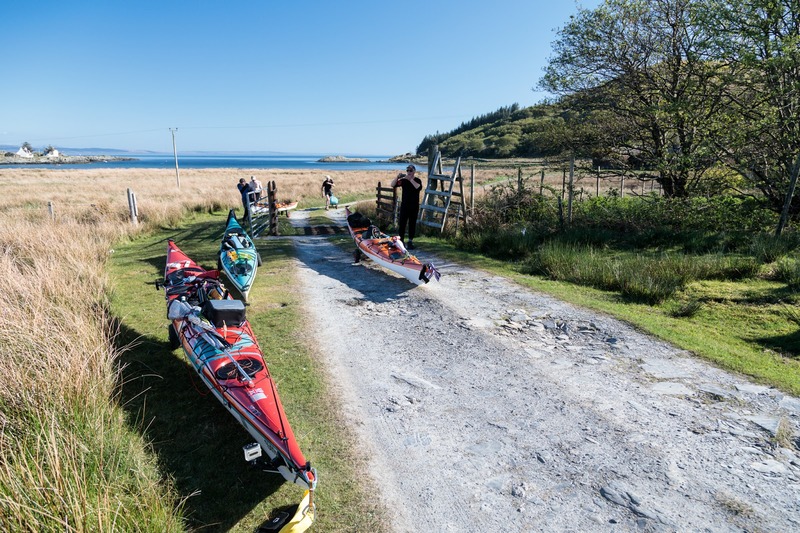 Due to the last minute change in venue we were just too late to catch the north east going flood tide in time to get through the Corryvreckan before the start of the ebb. As a result our rout SW to Tarbert was thwarted by the last of the NE going tide. 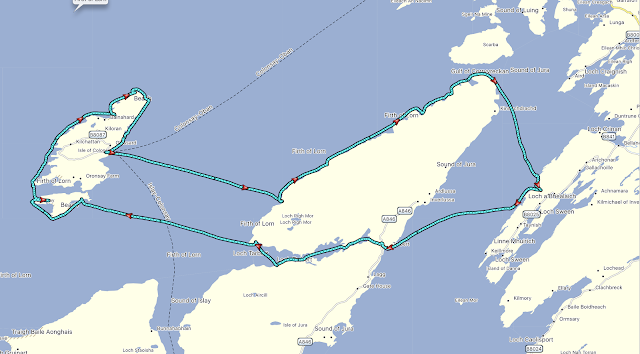 However, a SW going eddy runs down the delightful channel inside the islands to the SW of Carsaig Bay. 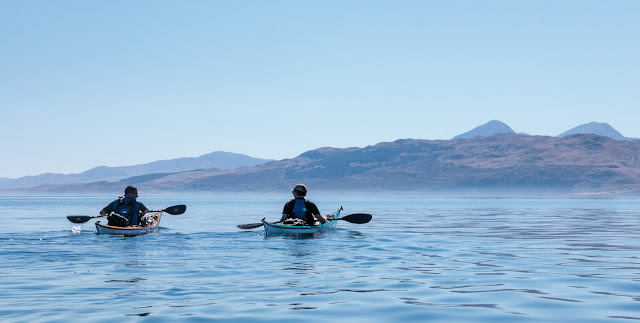 It was very pleasant being carried towards the distant Paps by the swirling waters of the Sound of Jura. 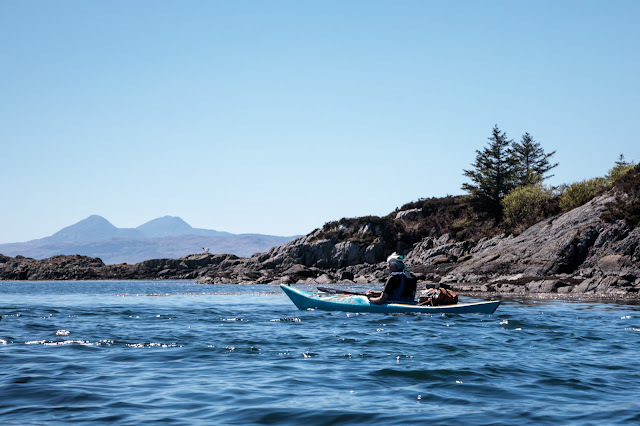 However, all good things come to an end and we set off across the Sound of Jura with the tide carrying us to the NE. We did not bother ferry gliding because the tide was due to turn when we were in mid chanell. Slack water arrived bang on time and with it the light breeze dropped, leaving a glassy calm. You can see where the tide changed, mid channel on the first part of our route to the isles (bottom right). ...we reached the entrance to Tarbert Bay on Jura we were being carried along at 8km/hour. 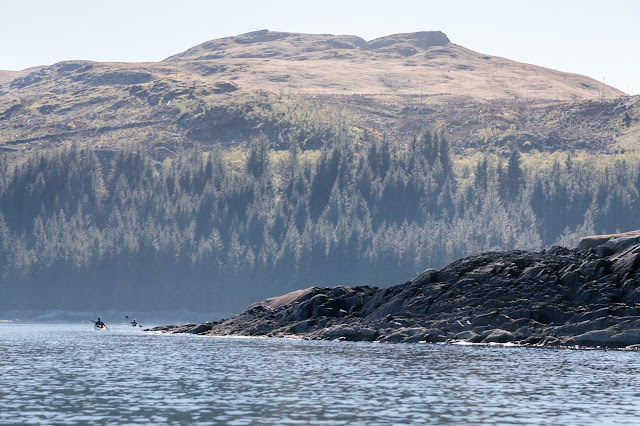 As we slid into Tarbert Bay, we were following an ancient coffin route from Argyll to the Isles. So our journey was to follow the route of the dead on their last journey. 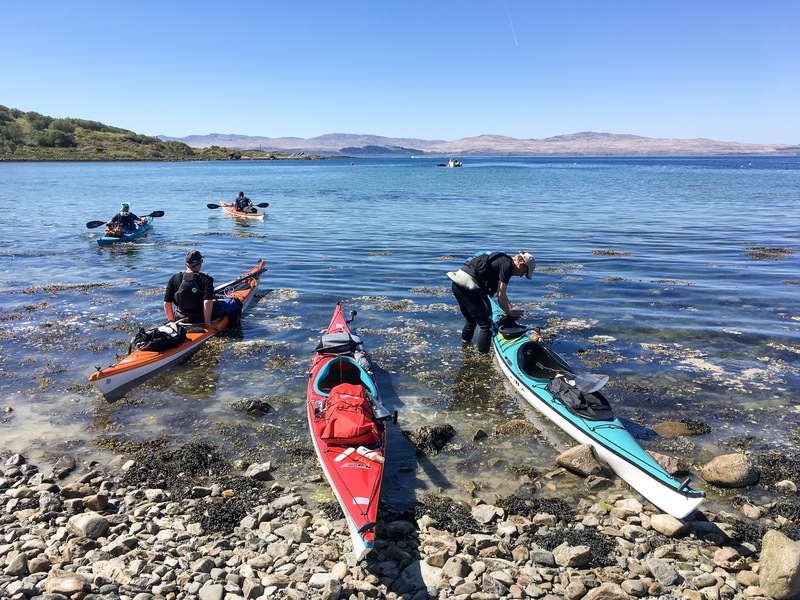 To avoid the tidal Gulf of Corryvreckan to the north and the Sound of Islay to the south, our bereaved ancestors landed at Tarbert and set off on foot across the narrow isthmus that joins the north and south parts of Jura. Their destination was the head of West Loch Tarbert, a deep sea loch which nearly bisects the island. 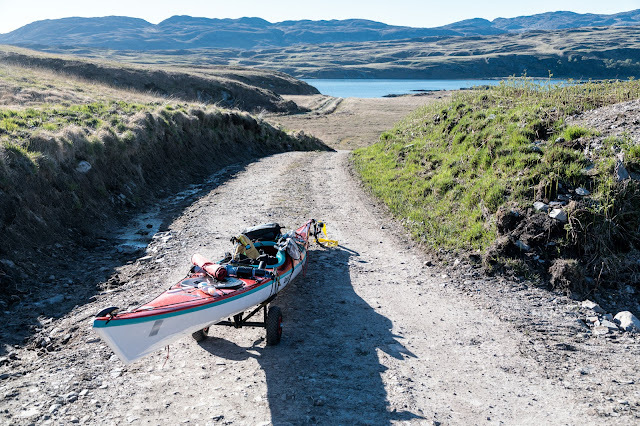 So we loaded our kayaks onto trolleys and set off in our ancestors footsteps... on the coffin road to the west. Like them we were heavily laden and rested our kayaks at many of the spots they would have rested their coffins. 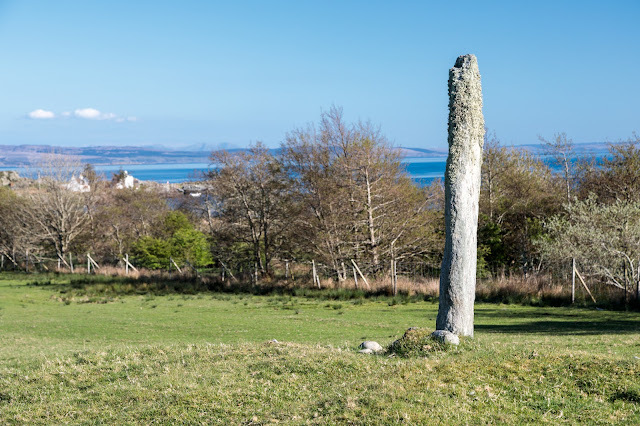 This ancient standing stone marks the route. It predates Christianity by thousands of years but there is also an ancient chapel nearby where mourners would have said prayers for the safe journey of the departed to the next world and for their own safe return from their journey to the isles. 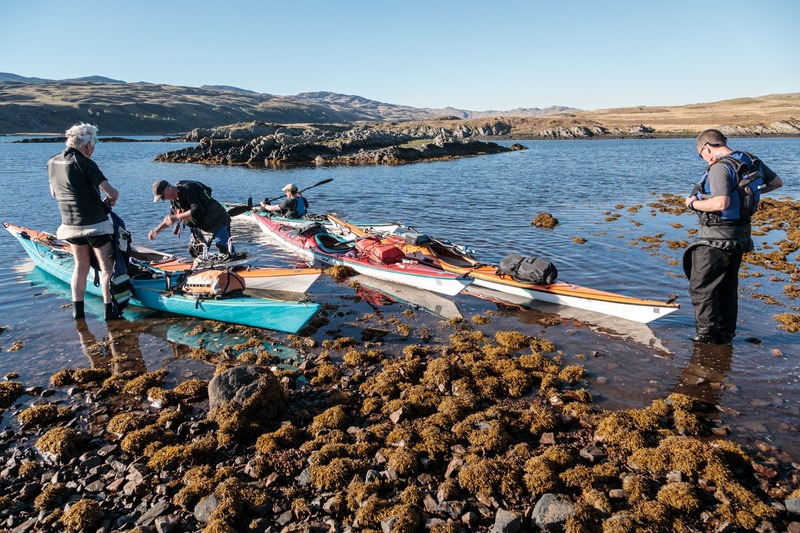 After a long hard portage it was a relief to see the head of the loch and that the tide was still in. The head of West Loch Tarbert drains almost completely so it is worth timing your arrival for round HW, which is 40 minutes after Oban HW. There is a narrow sea gorge to manoeuvre through to exit the inner loch. 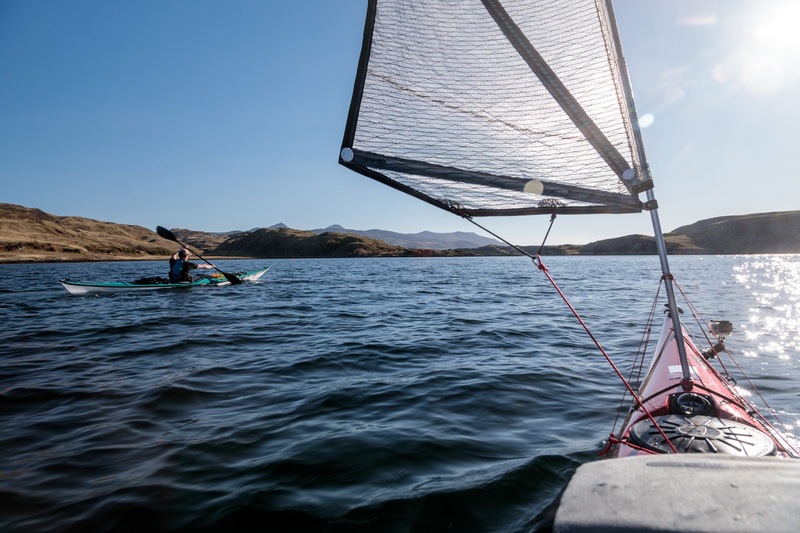 The tide runs through it at 8 knots springs so you better set off on the ebb! Just as we were leaving, the local resident laird, Andrew Fletcher, his wife and daughters passed by. They gave us big smiles and welcoming waves. It is a most wonderful feeling of lightness getting back in a boat after a laden portage. Our passage was assisted by both the ebb tide and a gentle NE breeze. 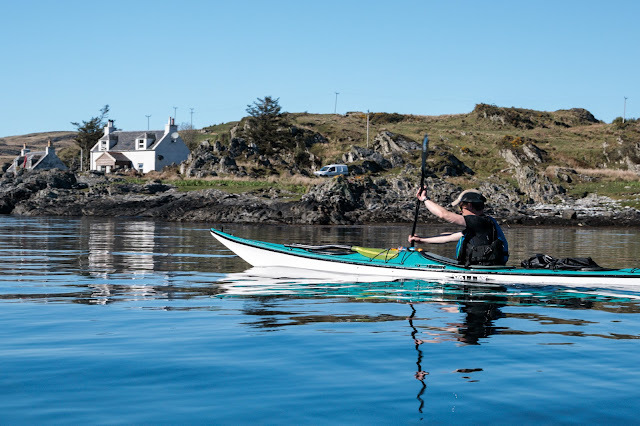 We had to press on as to achieve our goal of circumnavigating Colonsay, before David had to return to work. We had to get as far down West Loch Tarbert as possible and it was already 18:45!